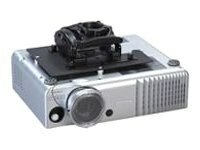 RPMA173 is an elite projector ceiling mount with keyed locking. Focusing on speed of installation, the all-new Elite series of custom and universal projector ceiling mounts is a first-class upgrade to RPA series. The RPM Elite series is packed with new easy-to-use features that save time and maximize projector security. Same great features of RPA series such as independent roll, pitch and yaw, integrated cable management, and All-Points security plus new, revolutionary design: simplified service for the end-user and improved ease of installation for the installer. RPMA173 is ideal for offices, schools, boardrooms, houses of worship and homes.